This Thirsty Thursday lights on a strange affair riven between three countries. The wine is from Domaine Terlato and Chapoutier. Neither name sounds very Australian. This is because Napa bound Tony Terlato began importing Michel Chapoutier’s wines from the Cotes du Rhone. A decade later in 1998, Michel discovered land in Australia, got excited, and got Tony to support planting Shiraz. Six years of drought delayed production, but by 2004 640 cases happened. At the same time, a larger plot over in Victoria grew Shiraz and Viognier: catnip for Michel to make into his own version of Australian Cote Rotie. Thus, 2012 saw 90% Shiraz and 10% Viognier cofermented and aged in stainless and cement tanks far from any barrel. The coferment retains shiraz’s brilliancy, while adding floral tones and much needed acidity. Appearance: a pretty intense ruby color with a razor thin clear rim. Aromas: smell of medium intense leather, marischino cherry syrup, violet, blackberries, and iron filings. Palate: feels dry, with just enough acidity, very present medium muscular tannins, warm coal alcohol 13.5%, making for a medium body. Flavors: taste properly focused, brambly blackberry, tart blood orange, laced with iron filings and a medium plus length. 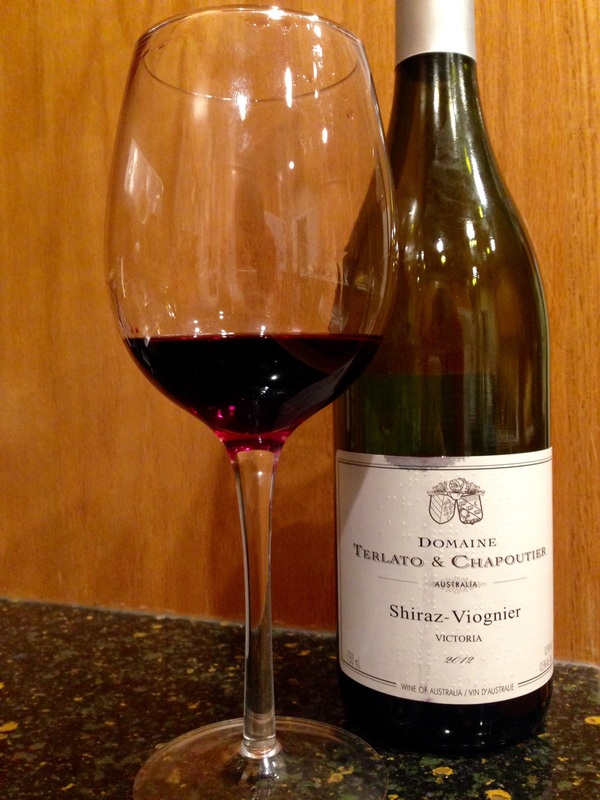 Terlato and Chapoutier’s Shiraz Viognier is continuously drinkable. The lack of oak allows shiraz to flaunt its spice and complexity. It is serious wine and could stand up to most foods yet drinks alone with youthful exuberance. At $16 you can’t go awry. This entry was posted in Red, Syrah, Uncategorized and tagged Australia, chapoutier, cote Rotiecote, Michel chapoutier, Shiraz, Terlato, Victoria, Viognier, wine. Bookmark the permalink.